I was first introduced to Poetry films in college back in 2012. I was studying Media Design in Cairo and one of my instructors assigned us to pick an Arabic poem and make a short film out of it. Up until then, I had never been more excited about an assignment, the task ignited something in me that was waiting to be unleashed, and since I grew up in a family that appreciated poetry which had me reading, writing and listening to poetry since the age of 10, the idea of mixing poetry with filmmaking came very natural to me and familiar. 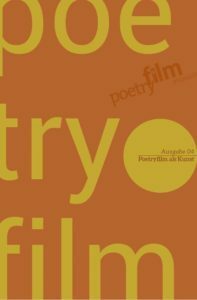 It only occurred to me later that it is actually a genre of film that has its unique fans, festivals and circle of directors, and that the discussion and debate of turning poems into films has been going on since the birth of cinema. I was surprised by how old and popular the idea was, even more so when I realized that it was completely alien to the Arab world. For some reason, Arabic Poetry, which is only the most significant form of art produced by the Arab world and considered one of the most visually rich and sophisticated breeds of poetry, had never officially taken part in the conversation of poetry films worldwide in a noteworthy manner. It sounded crazy to me, but I figured that it’s not surprising if you actually consider how many Arabs today appreciate or even understand their own poetry. But regardless of that, the main problem I saw was because of how poets and visual artists in the Arab world have no interest in collaborating with one another. The issue, as I see it, is from the literary experts side. For many writers, the argument usually made is that the beauty of poetry must be in the words only and how they manifest themselves visually in the imagination of each reader. However, this notion should not be threatened by the discourse of poetry films, because a poetry film is essentially a manifestation of the imagination exercise we go through while reading a poem. The defining line here is in accepting a Poetry film as an example of a visual representation of a poem as seen by one person. In the spring of 2013, I made my bachelor research on Animated Poetry films and how they can be used as a tool to revive Arabic poetry amongst Arab youth. It was certainly a very uncommon and risky research topic; all the same it made absolute sense to me, primarily because I was under a spell at the time by Mahmoud Darwish, the late Palestinian poet whose recording of his poem La’eb Al-Nard (»The Dice Player«) made me experience a euphoria that I had never felt before, nor since. It was a highly rich piece with intricate visuals and outstanding rhythm that to me demanded to be put in a film. I first screened my film The Dice Player* on a sunny Tuesday in June in my bachelor presentation, ever since then it has gone on a ride around the world. From Toronto to Kuala Lumpur, from Berlin to Abu Dhabi, suddenly it occurred to me that the idea made sense to a lot of people now, that they all saw the cinematic potential that exists in Arabic poetry. I encountered people who probably knew nothing about the Arabic language nor Mahmoud Darwish, and were actually interested in learning about them because of the film, and I was delighted to find people my age from the Arab world (my initial target audience), taking a liking to the film and finally recognizing the exquisite treasure we have in our own language. It surprised me ultimately that everybody I met agreed on the same thing, that there is so much that could be done with this genre and so many Arabic poems that have the potential to be manifested into magnificent visual pieces, but it all depends on us eventually accepting the genre and relishing what it has to offer. Nissmah Roshdy is a Media Designer based in Cairo, who graduated from the faculty of Applied Sciences and Arts from the German University in Cairo in 2014. Being a poet and writer before studying filmmaking, Nissmah made her bachelor degree on Arabic Poetry and how it can be visualized using animation, the result of which was her debut film La’eb Al-Nard (»The Dice Player«) based on a poem by Mahmoud Darwish. The film was one the first animated poetry films to be made with an Arabic poem, it gained popularity online, and went on to be screened in several festivals worldwide, winning the ZEBRA Film Prize for best Poetry Film in Berlin, the 2nd place in MasrDotBokra Film Festival in Cairo, and Best Animated Film in Zayed University Film Festival in Abu Dhabi.